I was struck today by a thought. We’re still renovating (painting) the new condo. Hubs and I have been working fairly effectively together. I’m doing the middle of the walls and he’s doing the detail work. We turned on some music, poured out the paint, and just got it done. The way we work in tandem amazes me. It’s very fluid. Like we’ve been working together for years. And really, I guess we have. It’s very different than my first marriage. My ex and I never worked together. Not before we were married. Not after. And certainly, as you can tell if you’ve been reading my blog—we don’t work together very well right now. There were opportunities. There are always opportunities when you’re in a relationship. Buying a home. Parenting. Even small things like making dinner. All things that Hubs and I do very efficiently together. And all things that the Goblin King and I had difficulty with. An IKEA cabinet. We made an attempt to work together. It just didn’t work. Even the start-up was difficult. He just started ripping open packages and wasn’t looking at the instructions. We ended up with the back of it on backwards. We argued. Then he just left and I had to figure it out and clean it up. I was very resentful. There was another opportunity when we needed to renovate our spare room. I pulled out the carpet on my own and asked him to remove it to the garage. After waiting a couple of weeks, I did it myself. Then I removed the wallpaper. Alone. I expected help with the painting—but didn’t even get an offer. Looking back on it, I don’t know why I ever expected help. Experience should have taught me that he never did. He was all talk—but no action. It got to the point where I would just do things on my own. Sure, we’d talk about them beforehand like he was going to help out. I’d wait for him to initiate. Then I’d just do it myself. And while I was doing it, the resentment would turn through my mind over and over like a poison. That’s what resentment does. It builds and builds like a wave until it crests over and washes you out. My indignation at his lack of action did nothing for me. It did nothing for my marriage. And it certainly never had any impact on changing his behavior. He was then—and he continues to be—the same person. My resentment hung over our marriage. It colored our relationship. Now that I’m divorced, I’ve washed the bitter wave of resentment out of my mouth. I’m not going to say that it doesn’t reoccur. It does. I still have to have a relationship with him. We have two young children that we need to parent. He’s still the same person. There are still times when I resent him. And there are plenty of times when I have to pick up the pieces. But recognizing the resentment as it happens has gone a long way to reducing my frustrations. If I catch the starting of the wave while it’s still small, I can disperse it as a mere ripple. As time goes on, the ripples get smaller and smaller and affect me less and less. For me, now, it’s a matter of choice. 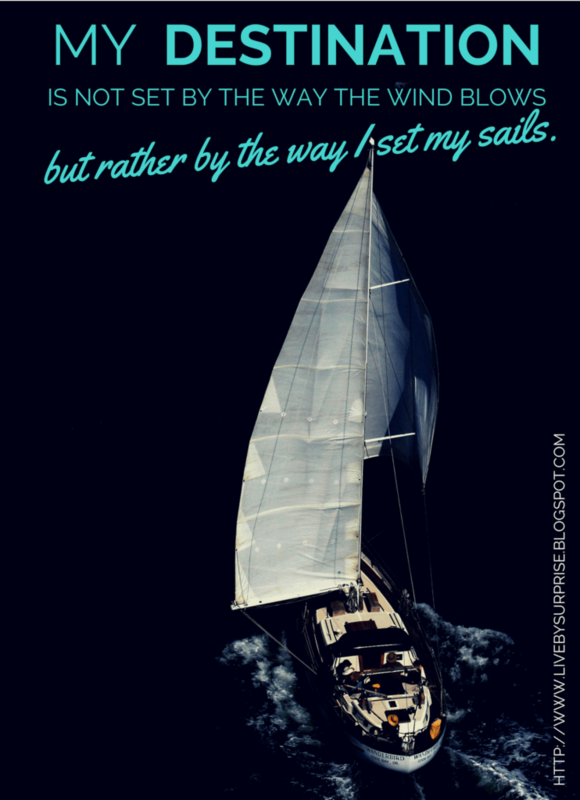 My destination is not chosen by the way the wind blows—but rather by the way I set my sails. This post originally appeared on Live by Surprise on November 10, 2014. It has been edited. Love this! Recognition of those feelings is a major feat and not letting color your new marriage is terrific. It was the same way for my husband and I. We just fit. Oh OK, so my ex and I could NOT ever settle on paint colors, landscaping. Anything, I usually ended up waiting so long that I just did it myself. Or, it just never got done because we couldn’t compromise. Maybe all couples should have to decorate a room together before they get married. Or put together ikea furniture. I can only imagine how that resentment can build up with his lack of investment and help. I’m so glad you can rid yourself of those waves and be intentional with your thoughts and feelings about it. “My destination is not chosen by the way the wind blows – but rather by the way I set my sails.” <— LOVE. Did you write that? It’s all about setting your intention and heading towards it.